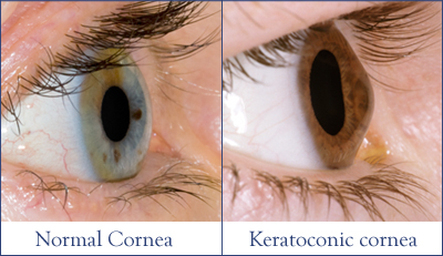 Keratoconus is a disorder that occurs when the cornea, which is typically rounded, becomes cone-shaped. The progression is usually slow and can stop at any stage from mild to severe. This distortion increases as the cornea bulges and thins. The apex of the cornea often scars, reducing the vision. Treatment of Keratoconus is most effective with gas permeable contact lenses or hybrid lenses , designed specifically for the irregular corneal surface. If contact lens treatment is not successful, surgical corneal transplant may be necessary. Cataract is a clouding or opacity of the natural internal lens of the eye. This opacity may be a small spot or may cover the entire lens. When light enters the eye it is scattered, causing images to appear hazy and blurred. There are many different types of cataracts. The one shown here is a cortical cataract. Here the opacity forms first is the periphery of the lens and develops inward, like spokes of a wheel. Ultimately, the best treatment is to remove the cataract lens and replace it with an acrylic man made lens. 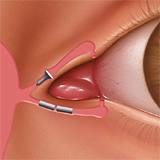 This is referred to as cataract surgery. We have a network of skilled surgeons in our area who we can refer you too when necessary. We also co-manage your post-op treatment when appropriate. 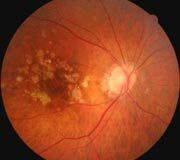 Macular Degeneration is a condition in which the central part of the back of the eye looses blood circulation. It is considered a natural aging process. 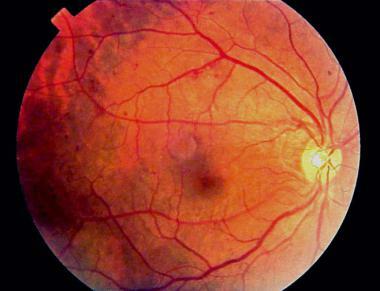 There is a breakdown of retinal pigment epithelium cells in the macular region. As the disease progresses, central vision diminishes. It is believed that this breakdown may be due to a lack of nutrients being supplied to the region. Additional studies have found a genetic link to this disease. Treatment can range from better nutritional management, sometimes to include a tablet containing the primary minerals and vitamins that are found lacking in many patients with macular degeneration. Glaucoma is a group of diseases that involve the deterioration of the optic nerve and a slow, irreversible loss of vision that is not detectable to the patient until very advanced. It is know as the “silent thief of vision” because it can slowly rob patients of sight even if they feel that their vision is normal. Fortunately, damage from glaucoma is largely preventable with early diagnosis and treatment. Tests to determine your eye pressure and peripheral vision are done in the comprehensive eye exam. Additional special tests are ordered to determine your risk. Glaucoma is often associated with high eye pressure but can also occur in persons with normal eye pressure. A family history of glaucoma and advanced age are other risk factors. We use the latest high tech instruments to diagnose and manage glaucoma including a Heidelburg HRT laser retinal tomographer and a Humphrey Visual field analyzer.